Avocados are my favorite fruits. You see, there are so many theories, opinions, and disciplines involved, that depending on whose viewpoint you are considering, the avocado could be a fruit, or a vegetable. Or it could be both. From a botanist’s standpoint, fruits are the edible, seed-bearing part of any plant, which an avocado is. They may also be defined as the swollen, fertilized ovary of a plant, from which new little plants will grow. Yikes, my salad just became the subject of The Birds and The Bees 101. Based on these ideas, fruits include not only peaches, mangos and avocados, but also squash, melon, and tomatoes. Beans and peas, which are the seeds of their respective plant, are all considered fruits of the pea variety. Broccoli and cauliflower are flowers. Mushrooms and truffles are fungus. Basically, from the botanist’s point of view, vegetables just don’t exist. At least they don’t refer to them in such terms. They do not refer to any part of a plant as a vegetable. They will refer to roots, seeds, leaves, branches, stems, flowers, etc. My son will be so glad to know that there is no such thing as vegetables. Unless he goes to culinary school, or becomes a greengrocer. In disciplines involved with the selling and preparation of produce, vegetables and fruits are categorized loosely by being sweet or not sweet. So, by the grocer’s definition, squash, avocados and tomatoes are vegetables. Generally, a greengrocer isn’t really concerned about the proper botanical definition of his produce. Smart marketing and traditional consumer language dictate that if a customer comes in looking for tomatoes and avocados, he is going to look in the vegetable section, so that’s where they should be displayed. And then there’s the federal government’s definition. It looks like they gave up a little bit trying to convince kids to eat their vegetables, so they just decided that ketchup is one and called it a day. Aside from the tomato value, it is largely corn syrup, after all. Using this logic, my son will be glad to call maple syrup a vegetable, and we can stop arguing about it all. Some culinary or nutrition oriented people will break it down into further classifications. Peanuts are legumes, but pecans and walnuts are nuts. Cauliflower, broccoli and Brussels sprouts are crucifers. Carrots and beets are roots, but potatoes are tubers. Celery is an aromatic. If you tried to really worry about it much, you could go bananas–which, by the way, are fruit. As I have mentioned before, my husband has a degree in Range and Wildlife Science. This means that he studied Botany, so in our house, avocados are fruits. I love the creamy flavor and texture of avocados, and find them to be very versatile. I enjoy them in soups, salads, and simply sprinkled with a little lime and salt and eaten with a spoon on the half shell. The dark green, rough skinned Haas avocados are the best. They are creamier in both texture and flavor. Use the bright green, smooth-skinned variety only if you can’t find the others. 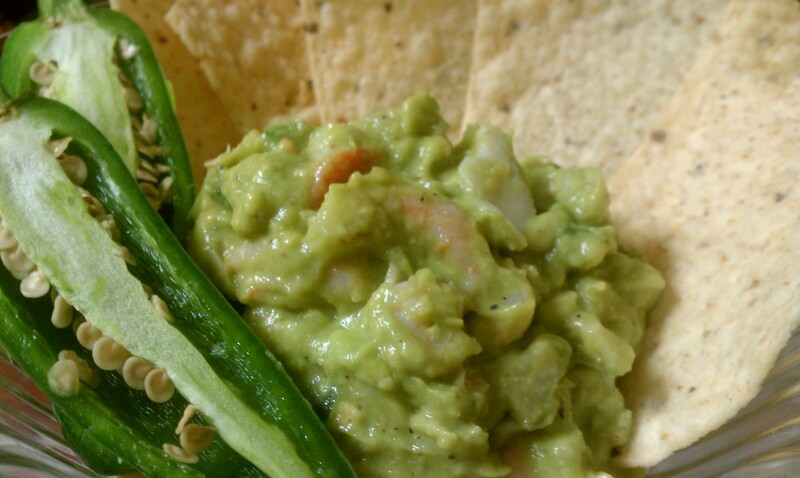 This is a simple, unadorned guacamole with the avocado lover in mind. It is enhanced with minimal additions, for those who want to enjoy the avocado the way God and nature intended it. Pictured with shrimp. Cut the avocados in half and remove the seeds. A gentle squeeze should pop the seeds right out. Using a spoon, scoop the flesh into a medium-sized bowl. Mash roughly with a fork, and stir in the remaining ingredients. **if not serving right away, press a piece of plastic wrap over the surface, pressing any air out of the guacamole and creating a tight seal. This will minimize browning on the surface, but if it does occur, simply stir just prior to serving. **if you like tomatoes in your guacamole, add them just prior to serving. Tomatoes will make the guacamole turn watery, and it will turn brown faster. In a large bowl, toss meatballs with taco seasoning and set aside. In another bowl, mix together cornbread mix, egg, milk, onion, jalapeno, and creamed corn. Line 2 muffin tins with foil cupcake papers that have been sprayed with cooking spray. Fill each cup half-full with cornbread mix. Push one meatball into center of each cup. Bake at 350* for 20 minutes. Allow to cool. Beat cream cheese and Ole Avocado together. 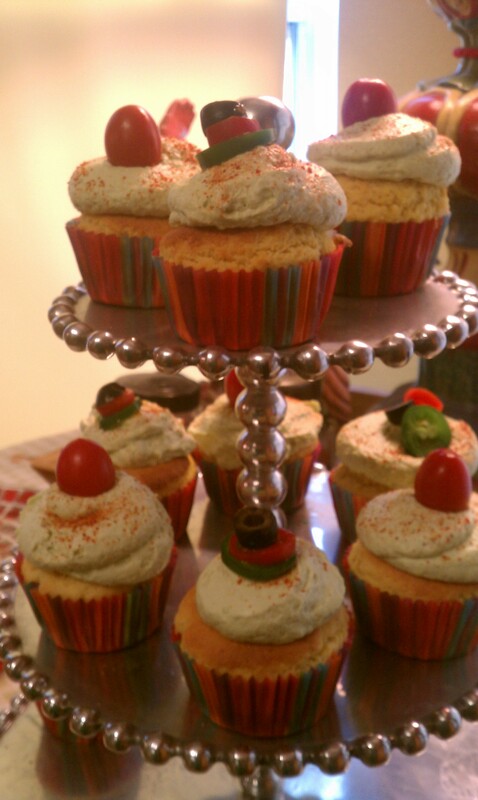 Pipe onto cooled cupcakes with a pastry bag. 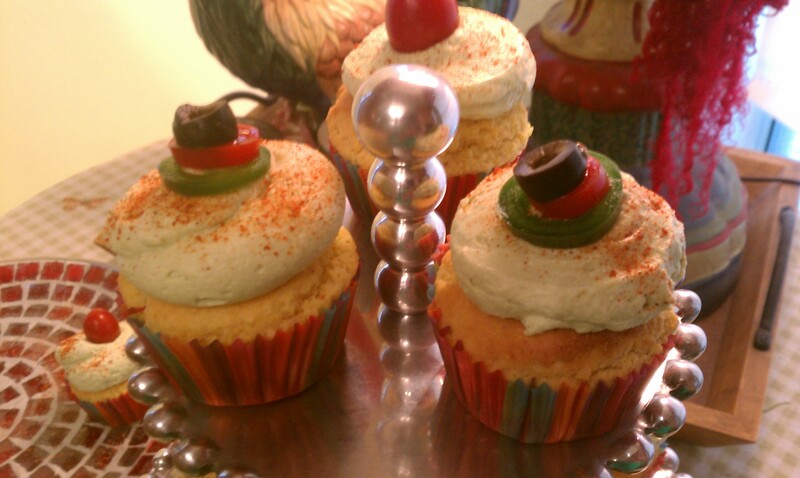 Top with olive slices, cherry tomatoes, or jalapeno as desired. Serve at room temp. Place all ingredients except for the cheese into a blender and pulse until smooth and combined. Add more or less half and half if you would like a thicker or thinner dressing. Stir in crumbled cheese. Store in refrigerator for up to 2 days. Serve over mixed greens, as a dip for vegetables, or spread on grilled corn. We try to incorporate avocados in many recipes… here are some great ideas! In my book, as avocados grow on huge trees, ergo they are a fruit. BTW, an banana is not a fruit, but a herb. Apart from that, I loved the tone of the post, great stuff. The avocado dressing sounds awesome, never heard of that! I throw an avocado into my smoothie every morning, it is the ingredient that makes it so smooth. Some interesting ideas, must try them. I’ve been seeing a lot of dessert recipes using avocado as well–it makes such a lovely creamy base for shakes and such. I even saw an avocado margarita recipe the other day! I have a friend that makes a killer avocado margarita. And my Sister makes a chocolate avocado fudge pie. They are so mild and creamy you really can do so much with them.